Home /Zionism: The Solution or the Problem for World Jewry? France's politicians and community leaders have criticized the "intolerable" violence against Paris' Jewish community, after a pro-Palestinian rally led to the vandalizing and looting of Jewish businesses and the burning of cars. It is the third time in a week where pro-Palestinian activists have clashed with the Paris's Jewish residents. On Sunday, locals reported chats of "Gas the Jews" and "Kill the Jews", as rioters attacked businesses in the Sarcelles district, known as "little Jerusalem". Religious leaders gathered for an interfaith service on Monday to call for calm, and Haim Korsia, the chief rabbi of France, and Hassen Chalghoumi, the imam of Drancy shook hands on the steps of the synagogue. Francois Pupponi, the mayor of Sarcelles, told BFMTV that the violent attacks were carried out by a "horde of savages." "When you head for the synagogue, when you burn a corner shop because it is Jewish-owned, you are committing an anti-Semitic act," interior minister Bernard Cazeneuve told reporters at a press conference at the local synagogue. “We called our town 'Little Jerusalem' because we felt at home here,” Laetitia, a longtime Sarcelles resident, told France 24. “We were safe, there were never any problems. And I just wasn't expecting anything like this. We are very shocked, really very shocked." Roger Cuikerman, head of the Representative Council of Jewish Institutions in France told Radio France International: "They are not screaming, 'Death to the Israelis' on the streets of Paris. They are screaming, "Death to the Jews." The community was not just scared, but "anguished." The government had banned a demonstration planned in Paris for Saturday, but posters were seen around the area which said “Come equipped with hammers, fire extinguishers and batons" and promised a "raid on the Jewish district”. 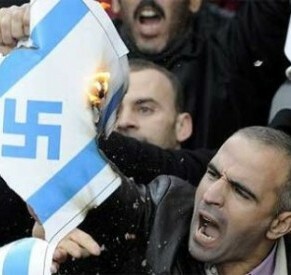 France has around half a million Jews, the biggest population in Europe, and around five million Muslims. The Society for the Protection of the Jewish Community's figures suggest that anti-Jewish violence is seven times higher than in the 1990s, and 40% of racist violence is against Jews, despite them making up just 1% of the population. More than a thousand Jews have made aliyah (the term used when Jews immigrate to Israel) in the past 10 days, according to the Israeli government. "I came because of anti-Semitism,” said teary-eyed Veronique Rivka Buzaglo, one of 430 immigrants who arrived from France the day before. "You see it in the eyes of people. I see it in everything," she told HuffPost. Buzaglo says nothing would have stopped her from becoming an Israeli citizen this week - not even the rocket sirens frequently blaring in the south of the country, where she plans to live. Meanwhile, in Barawa, Somalia, Ali Dhere, a spokesman for the Islamic militant group Al-Shabab Al-Mujahideen delivered a sermon in a mosque on Sunday, July 27, calling upon Muslims to attack Jewish targets everywhere, according to a report by the Middle East Media Research Institute. He concluded by saying the Muslims in Somalia must take a lesson from the events in Gaza, since the Jews stand behind the enemies who are invading Somalia. Zionism was originally proposed as a "solution to the Jewish problem" and today we see more than ever just what a solution it was. Zionism today has become the central cause of anti-Semitism around the world. Blurring the boundaries between Jews and Zionists, anti-Israel demonstrations quickly turn into anti-Jewish demonstrations, with violent attacks on purely Jewish targets like synagogues and kosher shops. By calling themselves "Israel" and "the Jewish state" the Zionists encourage this confusion. And then they reap the benefits by absorbing hundreds of new immigrants. They capitalize on these incidents to hammer home their lesson that their state is an "insurance policy" for world Jewry - a place to run when anti-Semitism breaks out again. The Zionist visionary Theodor Herzl was the first to realize that anti-Semitism would benefit Zionism, as he wrote, "The anti-Semites will become our most dependable friends, the anti-Semitic countries our allies." Anti-Semites would provide the push necessary to get Jews to move to the Zionist state. Thus, those who target Jews around the world are only helping to actualize Herzl's plan. The Zionist state receives these Jewish immigrants with open arms and settles many of them in the West Bank, where they become instruments of the state in its war against the Palestinians. In contrast, true Judaism teaches us to live peacefully in exile until the messiah comes. We are to be loyal citizens of our home countries, as the prophet Jeremiah says, "Seek the peace of the city to which I have exiled you, and pray on its behalf to G-d, for with its peace will you have peace." Furthermore, we must make it clear to our neighbors everywhere that not all Jews are Zionists, not all Jews support the State of Israel and not all Jews support Israeli army operations like the current one. May there be peace in the Middle East and throughout the world, and may Jews and Muslims live together once again in harmony as in times past.